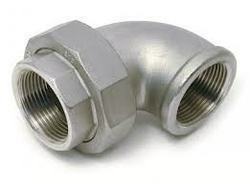 We are among the prominent firms engaged in offering highly qualitative Elbow Union. These accessories are manufactured as per the existing industrial quality guidelines based on the clients requirements and needs. These accessories are manufactured under the supervision of industry auditors by using the best quality of raw materials. These accessories are dimensionally accurate and facilitate easy installation and maintenance. These accessories are suitable for rugged use. Looking for Steel Elbow ?